Lawn care advice often distinguishes between warm-season and cool-season grasses, with each group being named after its best growing season. Warm-season grasses thrive in high temperatures; cool-season grasses love cooler weather. There are several turf varieties within each group, so you have plenty of options depending on where you live, where you need sod and how you plan to use your lawn once it is established. Prized for their ability to flourish in intense heat, warm-season grasses are generally used in lawns throughout the southern third of the U.S. Region: Prized for their ability to flourish in intense heat, warm-season grasses are generally used in lawns throughout the southern third of the U.S., as well as in some of the transitional areas including parts of North Carolina, Arkansas and Tennessee. Climate: Warm-season grasses love tropical, and sometimes even scorching, climates. They prefer temperatures ranging from 80 to 95 degrees. Some varieties tolerate the cold better than others. But don’t worry: If it gets too cold, they’ll simply protect themselves by going dormant. So while they may get a little brown in February and March, they’ll become green again once the temperature starts to rise. Watering needs: Most warm-season grasses can survive on less water than their cool-season cousins. Without sufficient irrigation, they’ll go into a protective mode. They’ll turn brown until water is once again available. Then they’ll green up again. Varieties: The four major types of warm-season grass are Bermuda, Centipede, St. Augustine and Zoysia. Best season to plant: You can lay warm-season turf at almost any time of year. Turf laid in the fall will probably stay dormant until spring, and will really start taking off mid-summer when the temperatures are hottest. Just remember that even dormant sod needs water, so that the soil doesn’t dry out before the growing season begins. Establishing a warm-season grass: Give your warm-season grass adequate time to fully establish itself. The first year or two, it will use most of its energy establishing deep roots. The turf will fully take hold in years two and three. Warm-season grasses are most active in spring and summer. They are sturdy, and form a thick, dense cover as they mature. Cool-season grasses can be found extensively throughout the northern two-thirds of the U.S., from Maine to Oregon, Minnesota to parts of Missouri and Kansas. Region: Known for their tolerance of winter weather, cool-season grasses can be found extensively throughout the northern two-thirds of the U.S., from Maine to Oregon, Minnesota to parts of Missouri and Kansas. They are also found in the central third of the U.S. – the transitional zones – where their use overlaps with warm-season grass varieties. Climate: The optimum temperature range for cool-season grasses is what some of us might call “chamber-of-commerce weather”: a balmy 60 to 75 degrees. While they don’t like extended hot periods, cool-season grasses are suited for areas where the temperatures fall well below freezing. Unlike their warm-season grass cousins, cool-season grasses tend to stay green in the winter without going dormant. Watering needs: Warm-season grasses stay healthiest with a consistent water supply. So unless there are regular intervals of rain, they require an irrigation system. They will tolerate some heat and drought by going dormant. But if those conditions extend for longer than a month, the turf is at risk of disease and dying. Varieties: The three major types of cool-season grass are Kentucky bluegrass, rye and fescue. 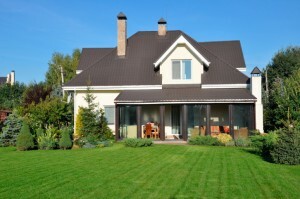 Plan to lay your cool-season turf at the start of one of the active-growth periods in either early spring or fall. Best season to plant: Plan to lay your cool-season turf at the start of one of the active-growth periods in either early spring or fall. If you lay this sod in the summer or winter, it will likely remain dormant until the temperature becomes more moderate. And as long as you can properly prepare the ground for new sod, you’re still okay to plant cool-season grass in the winter. But after the ground freezes, air pockets can form underneath the new sod and the grass won’t root until it thaws. Establishing a cool-season grass: Cool season grasses tend to establish quickly. Once established, expect cool-season grasses to begin growing when soil temperatures reach the low- to mid-40s. Lack of water, or too much heat, will slow their growth. If you live in a snowy climate, keep in mind that salt from the de-icing chemicals can be hard on turf. Be sure to choose a variety developed to be more salt-tolerant. Choosing the right sod doesn’t have to be confusing. Available at Lowe’s and Home Depot, Harmony turf, which makes it possible to buy premium quality grass that is adapted for your region and your application, sold by a growers’ network that adheres to rigorous Harmony standards. All you need to know is how you want your grass to function. If you have an area that gets high wear, ask for Harmony Play; normal wear is ideal for versatile Harmony Home; and an area that gets low amounts of sunlight requires Harmony Shade. And if you need more next year, you’ll always get the same quality grass variety but with Harmony’s incremental improvements. It will blend right in. Wherever you live, you can trust Harmony Turf varieties to be heartier, require less fertilizer, less water and are less susceptible to disease.